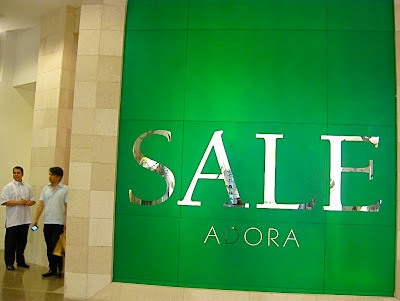 we almost missed this as we walked through greenbelt 5 a few days ago... this is the "global" floor of adora. it's actually the ground floor right beside zara and right across aldo. it's hard to miss the huge green sign, but you just might miss the small entrance off to the side. when you enter, the space is small and full of clearance items of the lower-end brands. and who knew adora had its own lift! go to the third floor, which houses the women's merchandise. there you'll find the high-end sale items on the floor with little cards that indicate the discount. we were able to get a chloé bag at 50% off woo-hoo!